Paducah City Hall is located at 300 South 5th Street, Paducah, KY 42002; phone: 270-444-8800. Photo: Anderson-Smith House (also known as Whitehaven or "Bide-a-wee"), ca. 0000, Listed on the National Register of Historic Places in 1984. Photographed by User:Smallbones (own work), 2010, [cc0-by-1.0 (creativecommons.org/publicdomain/zero/1.0/deed.en], via Wikimedia Commons, accessed September, 2013. Paducah, Kentucky, is the county seat of McCracken County and the largest city in the Jackson Purchase. This land was purchased by Isaac Shelby and Andrew Jackson from the Chickasaw Indians in 1819 and scattered settlement of the Purchase began immediately. In 1824 McCracken County was formed and in 1827 an inland county seat, Wilmington, was laid out. Most people who settled in McCracken County chose a site on the Ohio River near the convergence of the Tennessee River and Cumberland River. This community, first known as Pekin, was informally established in 1827 when William Clark commissioned an agent to plat the town. Twelve blocks of twelve lots each were laid out. Twenty-four lots were delineated in each block that faced the commercially valuable river front. A section of land was also set aside for a market house and the streets were named. By 1830 the town had been incorporated and the name changed to Paducah. The origin of the word Paducah is not definitely known, but a strong local legend has developed around a personality named Chief Paduke. In 1832 the county seat was moved from Wilmington to Paducah, a move that greatly accelerated the growth of the town. A square brick courthouse was built at the intersection of Market Street (now Second Street) and Broadway. In 1836 a market house was constructed next to this courthouse. Also in 1836 the two residential neighborhoods of lower town and upper town were incorporated into the city. Paducah experienced a commercial boom during the 1840s and 1850s. The necessity to market raw materials from McCracken County and the surrounding region encouraged the rapid expansion of merchandising and distributing facilities. Paducah constructed a city wharf on the Ohio River and established a steamboat-building industry. The construction of steamboats supported the local establishment of other industries, including iron foundries, rope and cordage factories, and lumber mills. The railroad was also developed as an important part of Paducah's transportation system. By 1854 Paducah was linked with the rest of the nation by the New Orleans and Ohio Railroad. Several educational and religious institutions were founded during the early part of Paducah's history. By the 1840s female and male academies were in operation in Paducah. These remained the principal educational institutions in McCracken County until 1858 when St. Mary's Academy was founded by three Catholic Sisters of Mercy. Also during this period several churches in Paducah were established. The Methodist denomination founded the first church in Paducah in 1833. Other churches being established were the Baptist in 1839, the Catholic in 1849, the Presbyterian in 1842, and the Episcopal in 1846. The current edifices for the Catholic, Methodist, and Presbyterian churches are included in this district. Political upheavals in Europe in the 1850s forced a substantial number of Europeans to leave their homes and emigrate to America. Many of the newcomers were attracted to the opportunities of the trading and manufacturing centers in the Ohio Valley. A substantial number of German Jewish families began to settle in Paducah during this mid-century period. These families purchased lots downtown and constructed their shops and businesses on the first floor and residences on the second floor. The last half of the nineteenth century was a time of industrial maturity and great prosperity for Paducah. The town was occupied by Federal troops for most of the Civil War, but only houses in the Lower Town neighborhood were destroyed in the brief Battle of Paducah. After the war Paducah regained its sound financial foundation. Trade and industry were vigorously developed and Paducah became an important provider for the war-damaged South. The foundation for the new prosperity was Paducah's transportation system, based on river travel and railroads. This developed transportation system helped sustain the growth of Paducah's industries. The city became an important link in the national trade network and a fundamental supply center for the surrounding agrarian region. By the turn of the century Paducah was the second largest manufacturing and distributing center in Kentucky. By 1902 Paducah had grown enough to be designated a second class city. This designation represents the beginning of a new period in Paducah's history. Before,the city had been dominated by self-sufficient enterprises and distinctive local architecture. 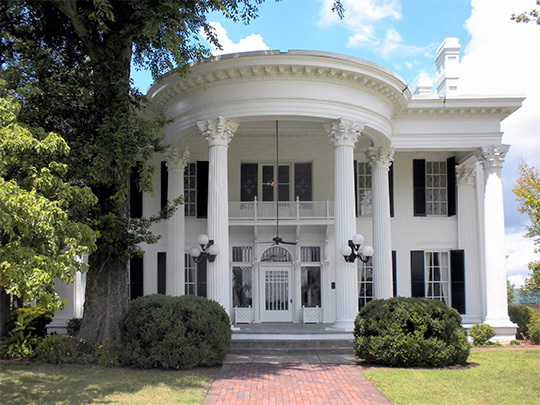 After the turn of the century, Paducah moved into an age distinguished by increasing national influences on the area's historic and architectural development. Paducah lost much of its isolation and self sufficiency and became a host for extensions of national enterprises. † Richard Holland, Preservation Planner, Paducah McCracken County Growth, Inc., Paducah Downtown Historic District, McCracken County, KY, nomination document, 1980, National Park Service, National Register of Historic Places, Washington, D.C.